Wuxi MQ ultrasonic Electrics Co., Ltd （MQ ultrasonic） located in Wuxi city, Jiangsu province, which is famous as source of ultrasonic technology in China, MQ ultrasonic is one of the Chinese leading manufactures in industrial ultrasonic cleaning equipments, piezoceramic elements and industrial cleaning and processing applications. At present, professional engineers and technicians are over 50% in our company. Through several years endeavor, we have established a series of manufacture and management system, our products are widely used in ultrasonic cleaning, joining, detection, processing and inspecting, etc, and win high praises from customers. Furthermore, our high-power cleaning equipments with multiple functions have got advantages in their strong power and high stability, especially applied by the users in chemical fiber industry. 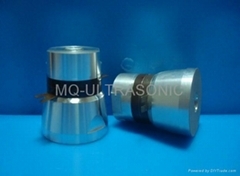 Now, our company develop and manufacture high-power radial vibration ultrasonic equipments (Ultrasonic tube and high frequency(200Khz-1Mhz) ultrasonic instrument. Ultrasonic tube can be widely used in the extraction of Chinese traditional medicines, decaling of pipeline, ultrasonic oil extraction, and so on. We are willing to provide high quality services to acoustic colleagues in ultrasonic cleaning, welding, processing and inspecting field, meantime, we are eager for a good cooperation with friends in ultrasonic area, and together making more and more progresses in the prosperous future.